You know, the first time I saw these on display in a picture, it was just a set of cuffs sitting on a table, and I puzzled. I had one of those, "ummmmm, okay?" moments. I just didn't get it. Then I saw this picture and that great big light bulb in my brain clicked on! NOW I get it! And I LOVE it. Which just goes to show... sometimes you have to show a product being used in order for your customers to "get it". Ruffle cuffs is a good example of this because they look absolutely awesome worn, but not so intriguing or interesting all by themselves sitting on a table. NOW? I want a pair! So what's the wonderful shop that turned me on to this very cool style? It's Crochex on Etsy. This shop is relatively small but definitely worth visiting and you won't want to miss it! Their prices are reasonable and their items are absolutely terrific. They carry a wide variety of items from little cozies to amigurumi animals (VERY cute) and fingerless gloves to wrist cuffs. TO VISIT MEOWKERNAUT'S CROCHEX SHOP ON ETSY, YOU CAN CLICK THE PICTURES ABOVE OR, IF YOU'D RATHER, CLICK RIGHT HERE! 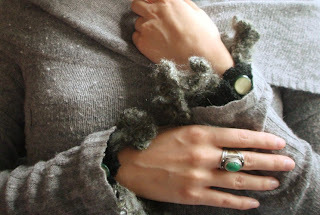 The ruffle cuffs are lovely! And, the other items in your shop are adorable. Love the ruffle cuffs!!! Following you now.